Many tropical or subtropical regions could see sharp increases in natural temperature variability as Earth's climate warms over coming decades, a new Duke University-led study suggests. These local changes could occur even though Earth's global mean surface air temperature (GMST) is likely to become less variable, the study shows. "This new finding runs counter to the popular notion that as the climate warms, temperature variability will increase and weather will get more volatile everywhere," said Patrick T. Brown, a postdoctoral research scientist at the Carnegie Institution for Science, who led the study while he was a doctoral student at Duke's Nicholas School of the Environment. "Our research suggests a different scenario: Global unforced temperature variability will actually decrease, not increase, as Earth warms, but local decade-to-decade variability could increase by as much as 50 percent in some places," Brown said. Because billions of people live in tropical or subtropical regions that may experience increased temperature variability, and because these regions are critical for biodiversity, food production and climate regulation, "it's vital that we understand the magnitude of unforced decade-to-decade variability that could occur there, and the mechanisms that drive it," he said. To conduct the study, they first inspected a climate model run under pre-industrial conditions. The model, which was developed at NOAA's Geophysical Fluid Dynamics Laboratory, simulates climate under perpetual atmospheric conditions similar to those experienced on Earth before the widespread emission of industrial greenhouse gasses. This allows scientists to get a clearer picture of the forces that cause variability in the absence of human drivers. "To isolate unforced variability, we looked at the model's output without changing any of its environment parameters, such as atmospheric carbon dioxide levels, solar radiation or volcanic activity, over a theoretical 900-year timespan," Brown explained. On the second run, the scientists doubled the model's atmospheric carbon dioxide levels to simulate projected future conditions. "In the doubled-CO2 run, we saw a 43 percent decrease in global temperature variability, but with local increases of up to 50 percent in many land regions of the tropics and subtropics," Brown said. What's happening, Brown said, is as Earth warms because of increasing CO2, there is less ice at high latitudes, which means less albedo - the less reflection of solar energy back into space. "Albedo feedback is a large contributor to decade-to-decade unforced variability. When Earth's atmosphere naturally gets a bit warmer, more of the reflective sea ice at high latitudes melts. This exposes more water, which absorbs solar energy and amplifies the initial warming, enhancing the GMST variability," he explained. "But we found that when you double the CO2 levels in a climate model to mimic future conditions, the sea ice melts so much that this albedo feedback can no longer play a large role in amplifying natural temperature variability." 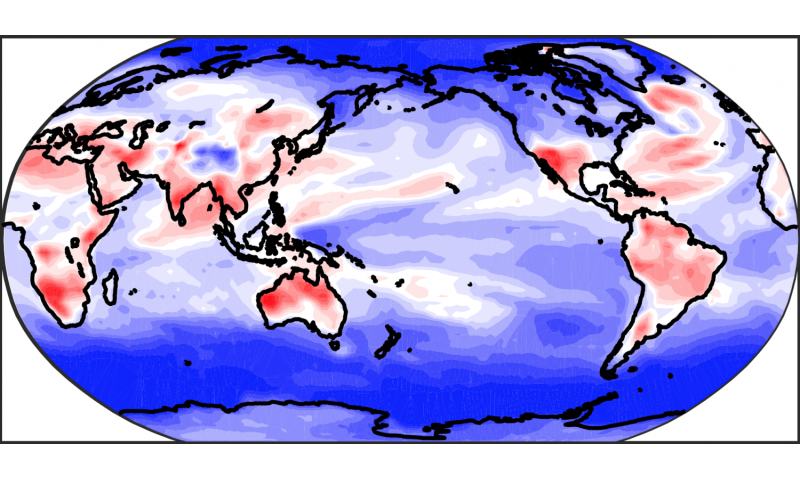 The end result is less variability globally - especially in the high latitudes - but more variability in the tropics. "This suggests that the pre-industrial control runs we have been using are not ideal for studying what unforced variability will look like in the future," said Wenhong Li, associate professor of climate at Duke's Nicholas School. "But it might inspire more modeling groups to run models under perpetual conditions that reflect what we expect in the future." Given how old Earth is and what scientist at best are speculating, it's difficult to consider anything that scientists are saying now as being factual. The final collapse of cognitive integrity: "I don't agree with what the experts say; therefore, the experts are wrong."